British women's clothing retailer Karen Millen has teamed with the architecture firm Mamou-Mani to create a series of window displays in The Regent Street Windows Project 2013. Mamou-Mani is one of our Rhino and Grasshopper clients. 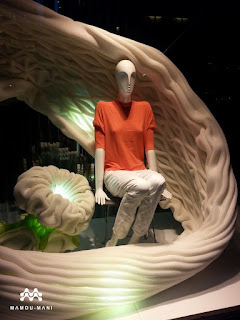 The Regent Street Windows Project connects fashion, architecture, and culture to create a series of unique window displays in London. Six teams of architects and retailers are on display till May 15th.